Sometimes finding the right meal plan can be such a time saver and money saver for your family! My friend Erin Chase at 5DollarDinners.com has come up with a great one for those of you looking specifically for a Gluten Free Meal Plan. Even better, the price of 20 meals is just $150! This is just $7.50 per meal. AWESOME! 5DollarDinners.com has conveniently put together these recipes using the prices at Costco, so there is only one store to shop at! 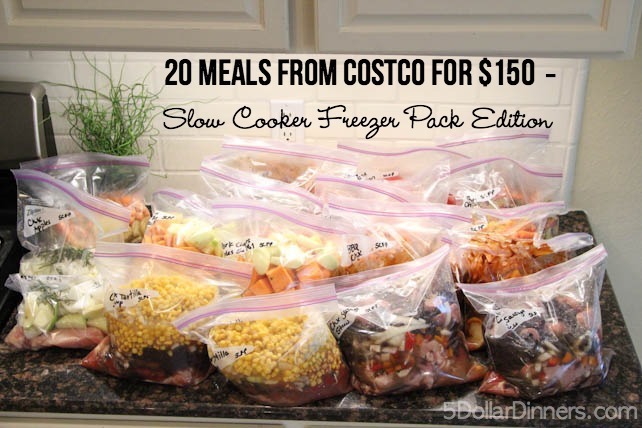 Find more ways to save at Costco here. Hi there! Love all this! What would you say to replacing the pork? I would leave it out completely of the stew and replace it with chicken breasts in the other two meals. just my thoughts! Has anyone tried to cook these packets after freezing? Do they taste good? I’m hesitate to freeze raw produce. I thought it would become mushy. GREAT idea, especially to find ingredients at just one store. Thank you! How many servings per meal? Around 4 servings per meal. HTH!